More about this on the full review on my blog. Scared Scriptless is the story of Maddy Carson, a 35 year-old talented script supervisor at the hit prime time show The Wrong Doctor. She is very organized and dedicated to her job. She grew up in a small town in Wolf County, in the Sierra Nevada Mountains. After high school, following a family friend’s suggestion, she moved to LA to what she thought was just going to be a sort of internship to get the hang of TV production. But it turned out to be a good career which she has enjoyed for the past 10 years. But this book is not only about the love triangle. On a trip to her hometown, Maddy finds out that everything is not running so great back home. So we follow her as she comes up with a brilliant idea on how she can save the day and keep everything in town running as smoothly and charming as she remembers it to be. 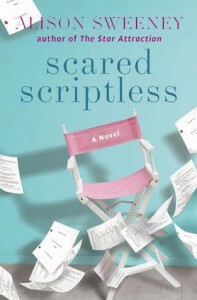 Scared Scriptless is Sweeney’s second book. Having not read the first one, I can’t say if this is a sequel. Even if it is, it is written as a standalone, you don’t get the feeling that you are missing details or info from the previous story. The characters in this book feel real and that’s what makes this story believable. But what also makes this book credible, are all the details on how a TV show is made. More about this on the full review on my blog. Samantha Brady may have left Salem for good, but Alison Sweeney is still around and I’m going to check out her next books in the future.